NSF is currently undertaking a formal process by which it will determine whether or not to divest from the Arecibo and Green Bank Observatories, with final decisions for each facility expected within the next year and a half. Over the past few months, the National Science Foundation has set in motion the process by which it will determine its future level of support for a set of astronomical facilities, including the Arecibo and Green Bank Observatories. Despite their unique capabilities, both observatories have been identified as candidates for funding reductions by multiple senior reviews over the past decade. 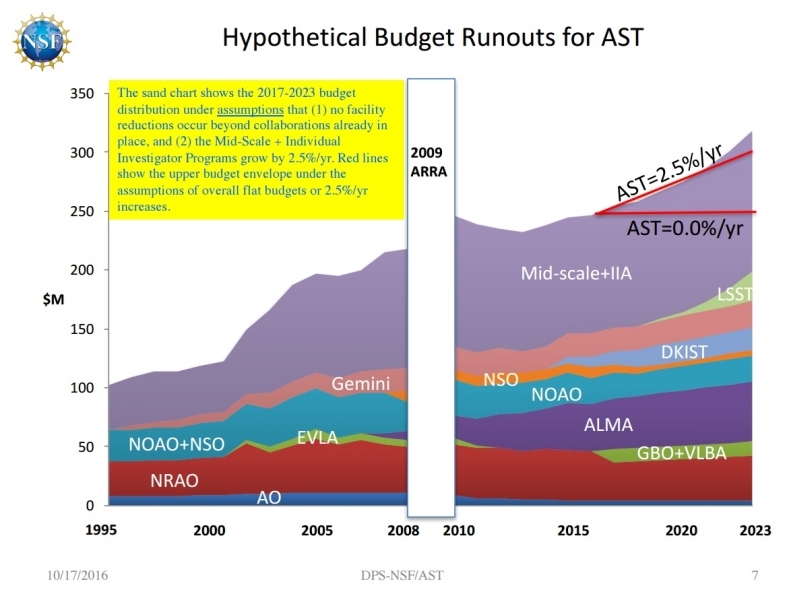 A primary rationale for withdrawing support is that because of budget constraints, NSF must free up funds for other facilities seen as more integral to achieving the science goals of the most recent decadal surveys for astronomy and astrophysics and for solar and space physics. If NSF does not do so and budgets remain mostly flat, facility operating costs are expected to squeeze funding for individual investigator grants and mid-scale research infrastructure. Arecibo (left) is located in Puerto Rico, and until the recent completion of China’s Five-hundred-meter Aperture Spherical Telescope (FAST), it long held the title of world’s largest telescope with its 305 meter dish. Green Bank is located in West Virginia within the National Radio Quiet Zone and has the world’s largest fully steerable telescope. NSF is carrying out an Environmental Impact Statement (EIS) process to inform its decision about whether or not to further ramp down funding for each facility and potentially mothball or deconstruct each. NSF initiated the EIS process for Arecibo in May and for Green Bank in October. (In July, NSF also launched an EIS for the Sacramento Peak Observatory, a small solar observatory in New Mexico.) Each EIS will assess the expected impacts of a set of alternatives being considered for each facility. At the Oct. 27 -28 meeting of the federal Astronomy and Astrophysics Advisory Committee, James Ulvestad, director of NSF’s astronomical sciences division, provided an overview of the EIS process. 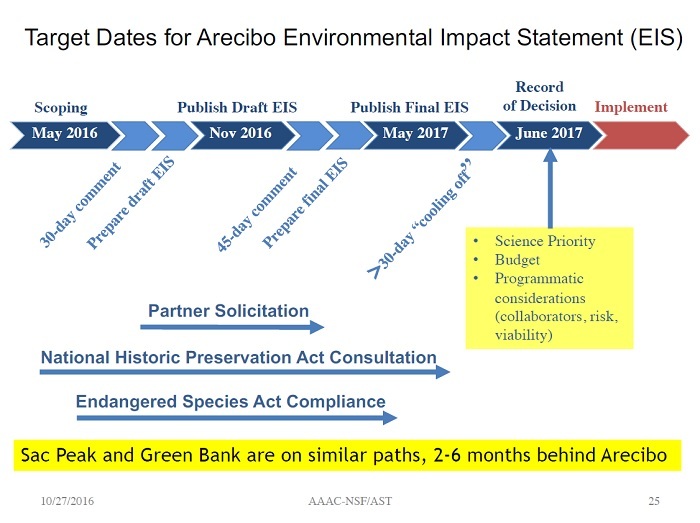 The below chart from his presentation depicts the timeline for the Arecibo EIS. Deconstruct the facility and conduct site restoration. In preparing the draft EIS, NSF solicited public comment and held two public scoping meetings in Puerto Rico. The full text of the comments received and transcripts of the public meetings are included in the EIS. In total, NSF received 240 responses, and all but one expressed opposition to closing the observatory. NSF is accepting comments on the draft EIS over the next 45 days and will hold two additional public meetings in Puerto Rico. NSF is considering a similar set of alternatives for Green Bank. The comment period for the Green Bank EIS announcement is open until Nov. 19, and NSF will be hosting two public scoping meetings in West Virginia on Nov. 9. NSF currently spends $8 million per year on operating expenses for Arecibo. This amount is split equally between NSF’s Division of Astronomical Sciences (AST) and its Division of Atmospheric and Geospace Sciences (AGS). Senior reviews of the AST portfolio completed in 2006 and 2012 identified Arecibo and Green Bank as candidates for funding reductions. The 2006 review recommended that NSF find funding partners for operation of Arecibo by 2011 or close the facility and recommended NSF reduce funding for Green Bank. The 2012 review concluded that NSF should divest from Green Bank by fiscal year 2017 and reassess its contribution to Arecibo later in the decade. Funding for mid-scale research infrastructure and individual investigator grants will be squeezed unless AST reduces funding for facilities or receives an increase to its top line budget. Chart from an Oct. 17 presentation by James Ulvestad at a meeting of the American Astronomical Society’s Division for Planetary Sciences. Click to enlarge. NSF has already ramped down support of both facilities. Starting in fiscal year 2010, NASA began contributing $2 million per year to Arecibo in support of near-Earth object (NEO) characterization. This amount has since grown to $3.7 million per year. NASA’s support has permitted the overall operating budget to remain at around $12 million per year as NSF has reduced its overall contribution. However, in a comment submitted as part of the EIS process, Patrick Taylor, group lead for planetary radar at Arecibo, warned, “Any level of divestment by the NSF of Arecibo, without replacement of that funding from some source, will endanger the NASA-supported work that we do, which is also congressionally mandated, of tracking and characterizing potentially hazardous asteroids.” Sec. 321 of the NASA Authorization Act of 2005 mandates that NASA detect, track, catalogue, and characterize 90 percent of all near-Earth objects greater than 140 meters in diameter by 2020. At a recent House Science, Space, and Technology Committee hearing, Rep. Dana Rohrabacher (R-CA) expressed concern that taking Arecibo offline would leave the planet more vulnerable to asteroid impacts. In response, Ulvestad explained that Arecibo’s radar is used to characterize and track NEOs that have already been found, and that survey telescopes such as the in-construction Large Synoptic Survey Telescope are required to perform a comprehensive search for such objects. NASA Astrophysics Director Paul Hertz added that NASA’s Goldstone Radar can characterize NEOs as well, and unlike Arecibo it is steerable. As for Green Bank, if Congress provides appropriations consistent with the president's budget request, NSF plans to allocate Green Bank $8.2 million in fiscal year 2017 from the "Other Astronomical Facilities" account, an amount which represents approximately 75 percent of the observatory's base budget. NSF’s fiscal year 2017 budget request lists $11.85 million as the fiscal year 2018 estimate for the “Other Astronomical Facilities” account and notes that “notional funding beyond FY 2018 is shown as flat, although it is expected that the out-year numbers will change significantly as partnerships evolve.” Notably, last year Green Bank secured $2 million in funding per year for five years as a part of the Breakthrough Listen extraterrestrial intelligence search initiative. Correction: The initial version of this article incorrectly stated that NSF is now funding about 60 percent of Green Bank's operating costs and plans to decrease its contribution to 30 percent in 2018. These figures were drawn from an erroneous news report. In fact, according to NSF, the agency plans to allocate $8.2 million to Green Bank in fiscal year 2017, an amount which represents approximately 75 percent of its base budget. Furthermore, in the fiscal year 2017 budget request, the fiscal year 2018 estimate for the budget line which contains both Green Bank and the Very Long Baseline Array is $11.85 million, $0.35 million above the amount requested for fiscal year 2017. Finally, the initial version of this article stated that the Environmental Impact Statement process is “the primary vehicle” by which NSF will decide whether or not to ramp down funding for each facility. In fact, the EISs are one input into a broader decision making process which includes consideration of science priorities, budget constraints, and other programmatic considerations.